For almost 20 years, the Central Narcotics Bureau's (CNB) elite Special Task Force (STF) officers have been operating with little fanfare, but when a major drug bust here is announced, there is a high chance they were involved. As many as 13 recent operations bore their trademark tactics - swift and stealthy action. Until CNB declared that a $250,000 drug seizure on Aug 24 was the work of the STF, the last known report crediting the unit for a successful operation was in 2014. Formed in 1997, the unit is part of CNB's intelligence division. It recently stepped out of the shadows in a series of videos on Facebook and Instagram called #CNB247. 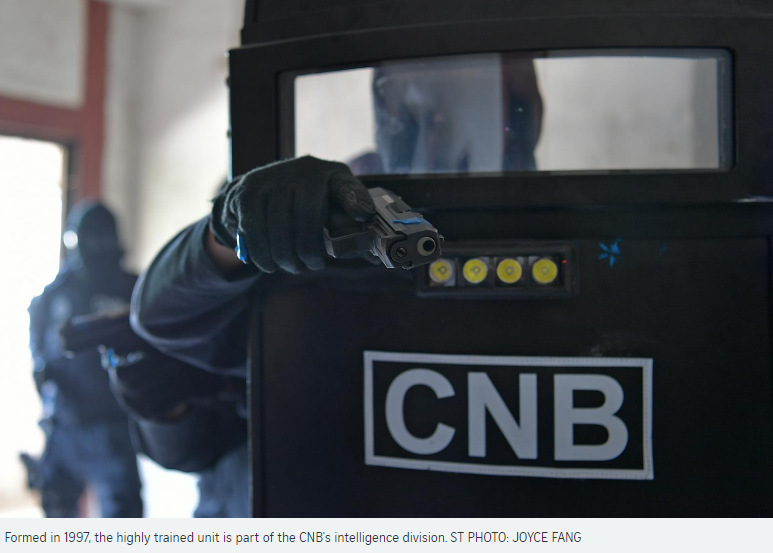 The videos, which can be found on the Facebook page "CNB Drug Free SG", showcase STF's skills, including vehicle interception, realistic effects training - where officers are shot at with non-lethal marking bullets - dynamic entry skills, and unarmed combat. A CNB spokesman said: "We decided to showcase the Special Task Force as we wanted to highlight the good, tough and dangerous work that they do, putting their lives on the line to help fight for a safer and drug-free Singapore." The Straits Times was given an inside look at the unit's training regime over two days late last month. During a rigorous self-defence training exercise, this ST reporter was "stabbed", slammed down many times and shot at six times while carrying a heavy 8kg ballistic shield in a room-clearing exercise that involved gunmen. The last of the STF videos (#CNB247) was released on CNB's Facebook page yesterday. CNB said the various exercises test the STF officer's reaction, firearm skills and resolve, all vital in high-risk operations. STF senior assistant director William Tan, who holds the rank of superintendent, said: "STF is getting more relevant in today's context. We need them to be specially trained in our skills and tools to handle drug syndicates which are more sophisticated than before." The latest operation the unit was involved in took place on Tuesday, where nearly 1.5kg of heroin worth over $100,000 was seized. Six people were arrested. CNB said the unit primarily exploits the element of surprise. A strike team must gain entry into the premises within 30 seconds, before the drugs are disposed of. During the training exercise ST witnessed, three STF officers dressed in fire-resistant overalls and bulletproof vests breached a flat with ease, using tools like a bolt cutter and a mini-ram. The unit is also equipped with the Xaver 400, a device which uses radar technology to "see" through walls. To be a member of the elite unit, a regular CNB officer must first go through a selection process, where physical fitness, endurance and mental aptitude are tested in various scenarios. Only then would the candidate be eligible to take part in the three-month STF course. Supt Tan said the various types of training help to prepare the officers for real scenarios they will face on the ground, which include suspects fleeing or putting up a fight. He said: "The officers have different options - they have their voice, they have their hands, they even have their batons and they have their pistols. "Which is the appropriate force to use? The use of force must not be excessive," Supt Tan added. It was quiet but tense as the elite Central Narcotics Bureau (CNB) team geared up for a raid, one floor above a drug trafficker's flat near Teck Whye Lane. The men from CNB's Special Task Force (STF) were whispering to one another while putting on protective vests, sleeves and gloves. The covert team took along door-busting equipment. After the order was issued to strike, it took the masked STF officers less than 10 seconds to burst into the flat, taking the occupants by surprise and leaving them no time to react. The STF had the main suspect, a 63-year-old Singaporean man who was arrested in his HDB flat, under close surveillance prior to the raid. The Sunday Times was allowed to witness the raid up-close last Wednesday morning. STF was formed in 1997 and the CNB, in a rare move more than a month ago, allowed ST to participate in a few training sessions. In an interview last month, STF senior assistant director William Tan said that the men and women of the STF are constantly assessed in scenario training to keep them in top form during operations where their reaction, speed, creativity and decision-making such as on the appropriate use of force are vital. "In terms of training, we try to be as realistic as possible. We add other elements, we plant 'family members'... You have to handle all the other people inside the house," Superintendent Tan said. In last Wednesday's raid, the STF team exploited the element of surprise by barging in at the right time. It did so just as an elderly occupant who was not the main suspect returned to the unit with plastic bags of food, avoiding the need to break down the door. A neighbour, who had been drying her hair in her living room as the raid was taking place, moved away from the door when she saw the STF officers. In the end, nobody was hurt in the raid. The war against drug abuse and traffickers is relentless. On Friday, CNB announced it arrested 108 people in a recent four-day, islandwide operation. It also seized about 2.1kg of heroin, 44g of Ice, 13g of cannabis, 19 Erimin-5 tablets, 10 Ecstasy tablets and 468g of new psychoactive substances. The suspect in the Teck Whye Lane drug bust allegedly threw drugs out of the rear window. But undercover CNB officers were positioned below the HDB block too. The suspect was later led to the back of the block where officers found two green files, two packets containing a brown substance and papers strewn on a grassy slope. The suspect, who was secured by two STF officers, was allowed to witness the retrieval of evidence. After a systematic search of the grass patch, the officers logged and dropped the items into evidence bags. Despite the drama, only a handful of residents living in the block of flats were aware of the CNB operation. The suspect was taken back to his flat where the officers continued a search of the premises. The CNB said its officers recovered about 876g of heroin, 29g of Ice and cash amounting to more than $87,000. In its news release, the CNB also said that just before the arrest, the suspect discarded a package through the unit's window. The package, which landed on a grass patch, was retrieved by officers and found to contain about 1,277g of heroin. The estimated value of the seizure was about $154,000. Investigations are ongoing. As many as 13 recent operations bore the imprint of the STF's swift and stealthy tactics. The STF usually stays out of the media spotlight, but the CNB attributed a big drug bust to the unit on Aug 24 in which $250,000 worth of drugs were seized.